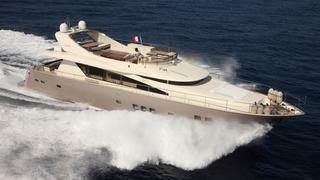 The 25m luxury yacht SOJA built by SEANEST was launched in 2007 and has been kept to the highest standards since then. 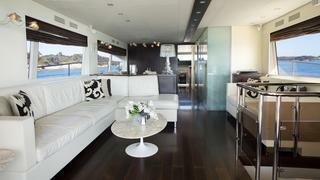 Motor yacht SOJA provides an elegant atmosphere and refined touches throughout the yacht! 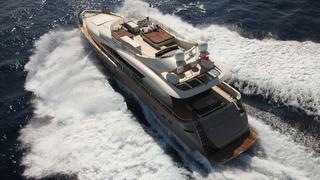 SOJA is a cutting edge yacht with an ideal layout for charters. 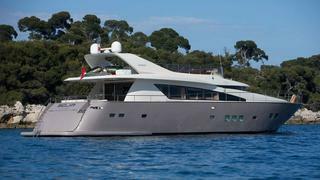 25.6 meters long motor yacht, 23 knots, with planning bottom, it guarantees all comforts and performances of its category, with the addition of a special accuracy for interior design and space enhancement. Nominated for innovation and practicality trophies by the 2008 World Yacht Trophies, luxury motor yacht SOJA has an exclusive and innovative design to enjoy an amazing cruising experience. The sleeping area has been thought to welcome up to eleven charter guests (8 adults, 1 teenager and 2 children) in a comfortable and elegant way. SOJA features one master cabin with one double bed and two couch beds, toilet and shower, 40” LCD TV dolby surround system by Bose, air conditioning system. 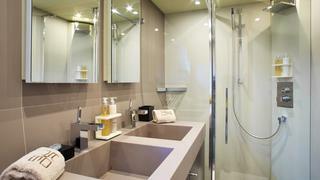 One guest cabin with a double bed, toilet and shower, 20” LCD TV dolby surround system by Bose, air conditioning system. 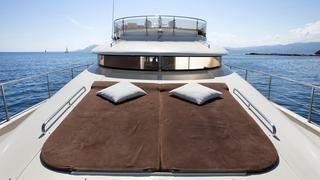 One double cabin, toilet and shower, 20” LCD TV dolby surround system by Bose, air conditioning system. 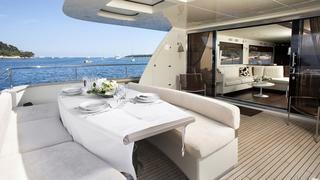 The fly features two large sun pads behind and alongside the second helm station, a 12-seater central table and sofas served by a galley/ barbecue unit and shaded by a tubular canopy extending from the roll-bar. 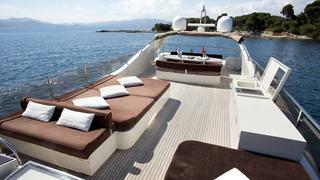 Further aft there’s also an open area for sun loungers. 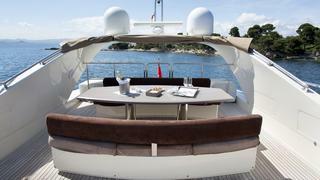 Bose system, external lights and local control complete the equipment for a relaxing cruise in the Mediterranean. Captain Thomas Rastoin and his crew will do their utmost to make your cruise unforgettable. This fantastic motor yacht has a wide array of water toys including a Williams 325 tender, waterskis, wakeboard, doughnuts and snorkeling gear.